• ABSOLUTELY FREE from synthetic preservatives, SLS, Parabens or PHtalates. • 15 active herbal ingredients for faster tattoo healing, deep skin hydration, maintaining vivid ink colours. ► DETAILS : Being a tattoo lover myself and having been inked many times, i know first hand the needs and particularities of the freshly tattoed skin. Tattoo healing period is the most important concerning the final look and feel of your tattoo. More than that, inked skin needs constant aftercare and hydration after tattoo has been healed, to maintain vivid and precise colours and to avoid tattoo's blur over time. There are two ways to heal your tattoo. The wrong one is to let your skin get dry, let it be itchy and crusted. The absolutely right way is to keep your tattoed skin area heavily moistured 24/7, and nutrify your complexion with soothing, healing, and anti-inflamatory herbal substances. 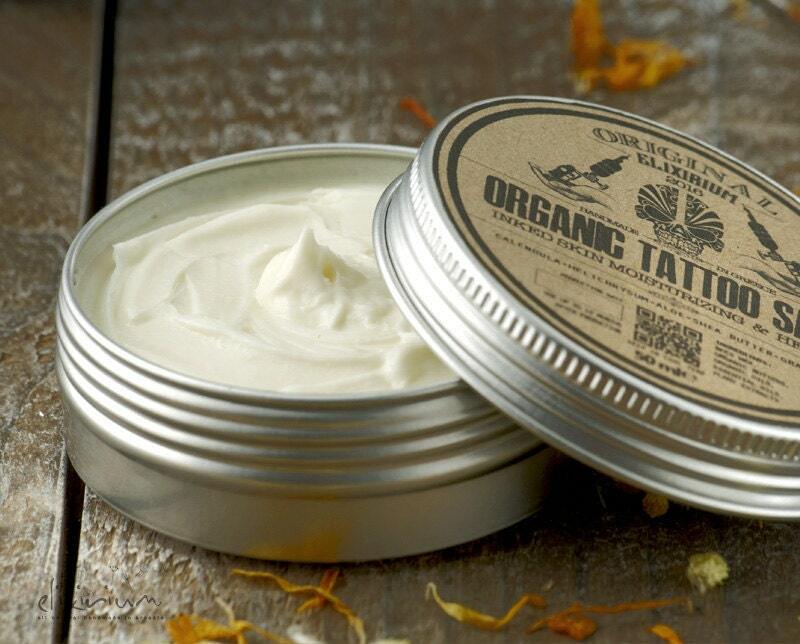 Elixirium's ORGANIC TATTOO SALVE contains 15 organic, natural, active, herbal ingredients. I perfected this formula after a lot of tries, in order to achieve maximum skin moisturizing for long time period, and in the same time tattoo wound's soothing and healing. Organic Helichrysum essential oil, Helichrysum extract, Calendula oil, Aloe Vera, Shea butter and St John's Wort oil are some of this salve's ingredients that accomplish to speed up skin healing. Tea Tree essential oil, Eucalyptus essential oil and Lavender essential oil with their soothing, anti microbial and anti inflamatory properties maintain the health of your tattoo's wounds. Mint essential oil will fight your tattoo wound itch. Extra Virgin Olive Oil, Grape Seed oil, Cocoa butter, Bee wax and Coconut butter will have your skin extremely hydrated, soft and as oily as it should be for your tattoo. Having this complicated and rather long list of ingredients, this salve is all you need to use after you have your ink done. 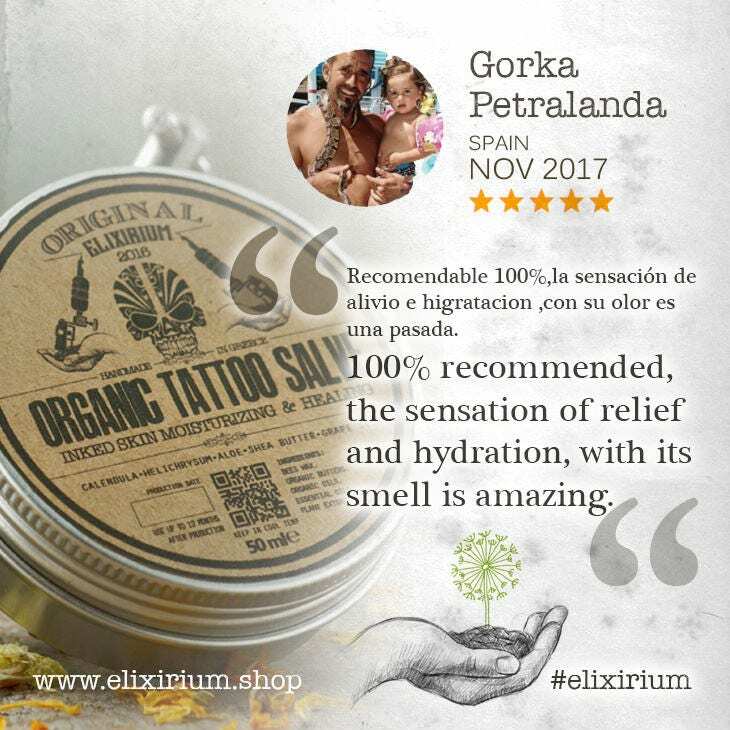 With 100% natural, herbal ingredients will heal your tattoo faster and safer than any chemical based, pharmaceutical product and more than that, will keep your tattoo vivid and healthy for a long long time. 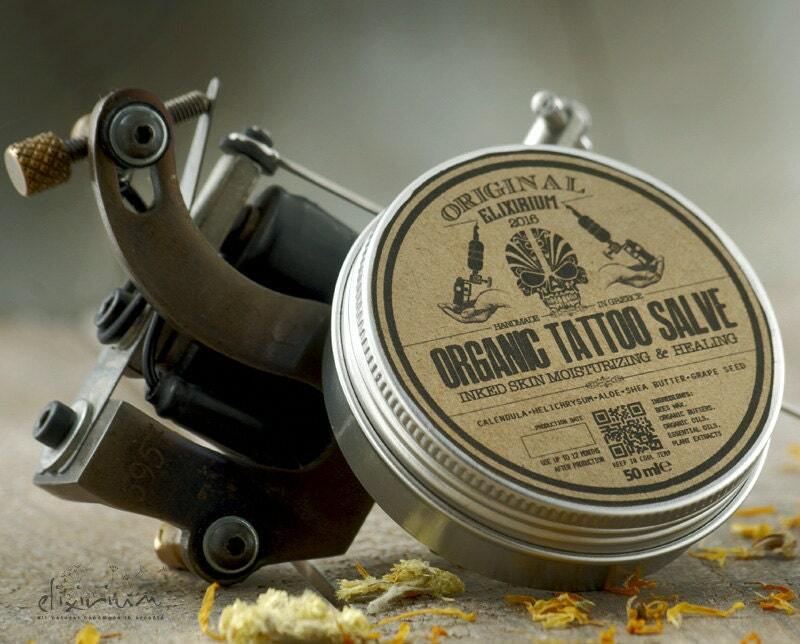 ► INSTRUCTIONS : Apply a layer of salve all over tattoo area. Rub gently using circular movements. Repeat application several times in day in order to keep your tattoo always hydrated. 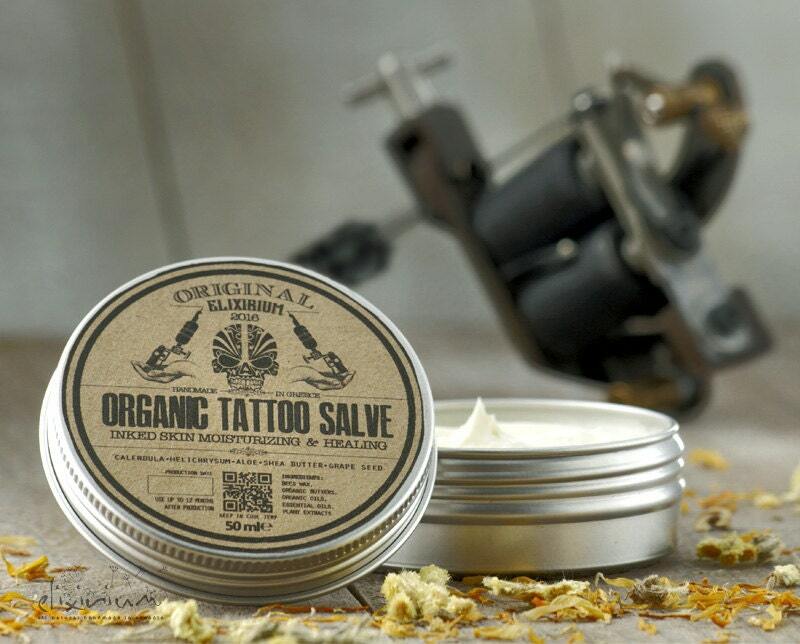 Use ORGANIC TATTOO SALVE as a tattoo moisturizer every now and then, after tattoo heal, for maintaining for long your tattoo colour vivid and contrasty. ❆ Store and keep in a cool place. ► SHELF LIFE : Elixirium products are pure and absolutely preservatives-free so for optimal results use it up to 12 months from production date indicated on the bottle. All ELIXIRIUM products are handmade by me after your order so always arrive at your hands all fresh. Feel free to contact me for any questions ! ♼ All elixirium products come in environmental friendly packaging and bottles. Please recycle after use. All of ELIXIRIUM products are shipped securely & effectively via Hellenic Post (ELTA) as Registered Mail which includes a signature confirmation by the recipient upon delivery and a international tracking number which let you check your shippment status 24/7 during shippment process. Can you make something especially for me ? Sure I can. If you have a special need or a special request and you feel the need for a custom made formula or product, do contact me. I will be happy to make something that will meet your needs. Would you use your own products ? Arriving very quickly, and so beautifully packaged I didn't want to mess it up! I'm in love with this stuff! It's absolutely awesome for moisturizing my new tattoo, and smells like heaven!